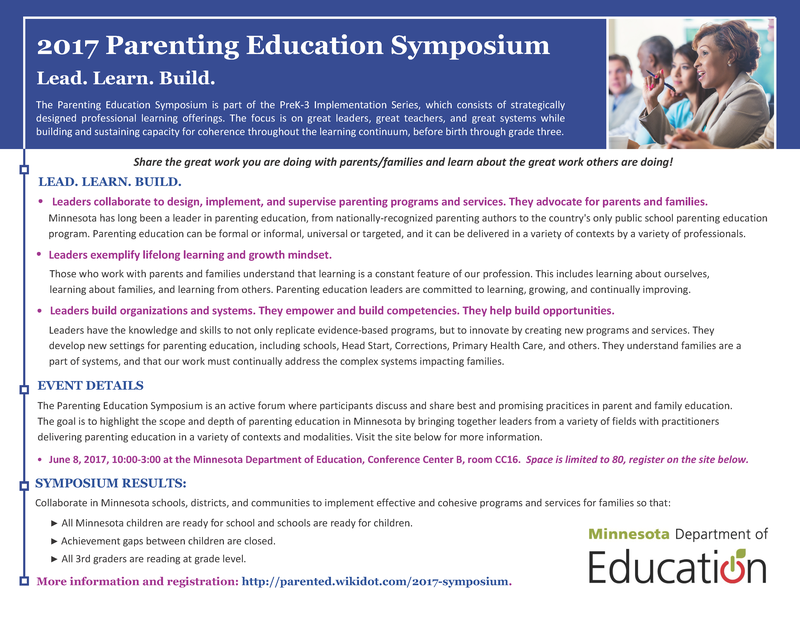 Click Here for 2018 Symposium page The Parenting Education Symposium is an active, engaging forum where participants discuss, share, and build best and promising programming and services in parent and family education. 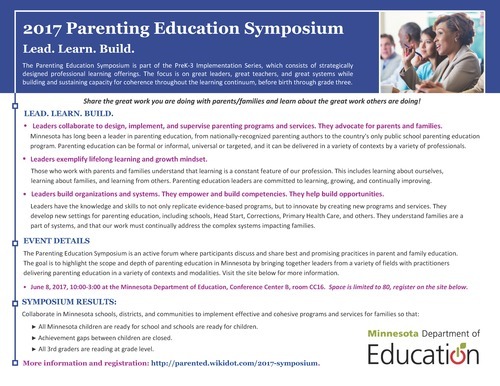 The goal is to highlight the scope and depth of parenting education in Minnesota by bringing together leaders from a variety of fields with practitioners delivering parenting education in a variety of contexts and modalities. Together, we will lead, learn, and build in order better meet the needs of children and their families in our communities. The 2017 Parenting Education Symposium is designed to be an engaging, productive forum where participants discuss and share best and promising practices in parent and family education. One goal is to highlight the scope and depth of parenting education programming and services in Minnesota. The symposium will bring together leaders from a variety of fields and practitioners who design/deliver parenting education in a variety of contexts and modalities. A second goal is to collaborate on building or enhancing parenting education services, programs, and/or systems. Leaders and practitioners who provide some type of educational services/programming to parents/families with children before birth up to third grade. The symposium seeks participants representing systems (e.g., education, human services, health care, justice/corrections, etc. ), programs (e.g., child care, community-based, ECFE, Head Start, Title I), and services (e.g., home visiting, early childhood screening, court-ordered parents, etc.). The symposium is designed for practitioners/leaders to share their parenting programs/services/expertise with colleagues. Sharing is in the form of small group poster sessions. For more information, see the Presenters tab. The symposium is also a great opportunity to learn about programs and services that you may want to provide, network with other professionals who work with families, and/or a way to enhance what you are currently providing. June 8, 2017, 10:00-3:00 at the Minnesota Department of Education, Conference Center B, room CC16. Space is limited to 80, registration tab is above. Leaders collaborate to design, implement, and supervise parenting programs and services. They advocate for parents and families.Minnesota has long been a leader in parenting education, from nationally-recognized parenting authors to the country's only public school parenting education program. Parenting education can be formal or informal, universal or targeted, and it can be delivered in a variety of contexts by a variety of professionals. Leaders exemplify lifelong learning and growth mindset. Those who work with parents and families understand that learning is a constant feature of our profession. This includes learning about ourselves, learning about families, and learning from others. Parenting education leaders are committed to learning, growing, and continually improving. Leaders build organizations and systems. They empower and build competencies. They help build opportunities. systems, and that our work must continually address the complex systems impacting families. Have the opportunity to showcase and share their parenting programs/services/research with colleagues. Learn about a variety of parenting programs and services. Network with other professionals who work with families or have expertise in families. During this time participants also discuss what they have learned with their team/group members and colleagues. Betty Emarita, Development and Training, Inc.
Topic presenters will present to the whole group. Topics will be related to families (e.g., family needs, family risk factors, family diversity, parenting education programs/services, working with families, importance of collaborative work, etc.). Topics may also be related to family services, programs, or systems. Poster presenters will share their work informally with small groups. Poster topics will be related to parenting education programs, services, or systems. These may be targeted to specific populations (e.g., teen parents, fathers, parents with children with special needs, families experiencing homelessness, parents of infants, etc. ), specific programs or services (e.g., home visiting, Early Childhood Screening, Parents Forever, specific parenting interventions, etc. ), general programs or services (e.g., parenting curricula/interventions, outreach, mental health, two-generation approaches, etc. ), new or innovative programs or services and information/research related to families and/or parenting education. Poster presenters will describe their poster topic on the registration form. A: Registration is limited to 95. A: Square or rectangle table arrangement with seating for 6-8. There will be space on the perimeter of the room to accommodate poster sessions. A: We are hoping professionals from a variety of backgrounds and professions will register. For example, Head Start, health care, public health, ECFE, K-12, child care, community-based organizations, higher education, etc. Since space is limited, it is hoped that leaders are able to represent various fields. In short, the audience will be people who work with parents/families providing some type of education and professionals who teach/train those who work with parents/families. It is likely that the majority of participants will be from ECFE programs. Q: Do I have to be an "expert" in order to be a Topic presenter? A: Since Topic presenters will be presenting to a group of 90-100 parenting/family professionals, we are looking for presenters with expertise in their field or the topic. Q: How long are Topic presentations? A: Topic presentations are either 20 or 30 minutes. Presenters can determine what they want to convey to the audience in this time period. Q: Do I have to be an "expert" in order to be a Poster presenter? A: Not at all (just an expert on the program or services you are discussing)! Q: Do I have to be a "parenting educator" to be a presenter? A: No. We are using a broad definition of parenting education (a professional who provides some type of education related to parenting). This ranges from those who do family engagement in schools, to health care providers who work with parenting issues, to those who provide intensive parenting interventions. Q: What does a poster session look like? A: Poster session time is informal. During each poster session, their will be 4-5 topics around the perimeter of the room. Participants will have the opportunity to visit and discuss the poster topics with presenters. Poster session time is also a time for group or collaborative work, so some participants may stay at their tables. Q: What should be included on the poster? A: The purpose of the poster is to provide a visual of the information you want to convey to participants (i.e., a graphic presentation of your parenting education initiative, program, service, etc.). You may want to illustrate your work by using graphs, photos, diagrams and a small amount of text on the poster. Presenters should decide how they want to design their poster(s). They can be formal (like posters on poster board that you would see at a research conference) or informal (created using poster paper, like self-stick easel paper). Presenters may also include handouts. Information can also be included on this webpage, so this will be another medium to convey your information/message. Q: Will poster presenters have a table? A: We will try to do our best to accommodate each presenter. If a presenter has a tri-fold presentation board, a table would be best suited to display the board. If a presenter has created a poster on self-adhering poster paper, he/she may prefer to just hang them on the wall. In short, please let us know your preferences. We will also have some easels available. Q: I am a poster presenter, do I stay for the entire day? A: It would be great if you could stay. The poster walkabout time is also a collaborative time. Q: Can I be a poster presenter for more than one session? A: Definitely! Presenters can present on the same topic twice or present on another topic. If you would like to present your topic twice, just let Mike know. We will also have a resource area where you can display information (or make information available). Q: I'm passionate about a topic and am wondering if it is better for a Topic or Poster presentation? A: Please email Mike (su.nm.etats|nworb.p.ekim#su.nm.etats|nworb.p.ekim) with any questions. CAAL: This presentation will discuss how CAAL works with parents and community leaders to use their voices to influence policy change. Celebrating Families: A 16 week course for families involved in Drug Court. Collaboration with Drug Court/Probation, New Ulm Medical Center, and Brown County Family Services. Minnesota Oral Health Project, its mission, vision, goals and strategies. PACER: Materials developed for parents to educated them about special education system and their rights and responsibilities within it. Parent Education at Minneapolis Voluntary Pre-Kindergarten (VPK) Schools. Parents as a Foundational Partner within an Early Childhood Center. Reach Out and Read: Reach Out and Read gives young children a foundation for success by incorporating books into pediatric care and encouraging families to read aloud together. Social Emotional Strategies Team. This group supports teachers, students, and parents in navigating student's challenging behaviors. Social Media Outreach: Provide examples of how we use social media to communicate program information and parent education resources. Space is limited to 95. Team sizes are also limited. Due to space limitations of the venue, we are prioritizing registrations to those who apply to do a poster presentation. There is space to describe your proposed poster on the registration/application form. Collaborations or programming/services that address a need area in parenting education. The overall goal of the series is to build and support leadership and educator competencies that result in the ability to implement effective, authentic family engagement systems. The professional learning modules provide us with a tool that districts can utilize for local implementation of family engagement systems. Professionals from the organizations below have participated in one or more of the Family Engagement professional learning series opportunities. Family Spirit is the first and only evidence-based family home visiting program developed by and for American Indians with Johns Hopkins Center for American Indian Research. Specially trained para-professionals or nurses see families in their homes throughout pregnancy to the child’s third birthday delivering 63 lessons on prenatal care, parenting, health, substance use, nutrition and goal-setting. Home visitors utilize the healthy relationship they have with parents to model problem-solving and communication techniques. Participants are also linked to other resources in the community. Johns Hopkins trains home visitors and oversees program implementation in over 100 sites nation-wide with continual growth. Currently in Minnesota, seven tribal communities offer the program, as well as one metro non-profit and a county in the NW with a high American Indian population. Others are interested in the program. MDH partners with Johns Hopkins to offer Family Spirit training as need arises. The next one is planned for October 2017 in Bemidji. Please contact Karla with any questions. The Minnesota Oral Health Project team were pleased to be a part of the Parenting Symposium 2017 and would like to extend an offer to all participants for MNOHP staff to be a presenter at your parent groups/staff meetings or provide educational materials for your parents or staff about oral health. See our website, www.crushcavities.com and our Facebook page, www.facebook.com/minnesotaoralhealthproject for more information.